“We look for medicine to be an orderly field of knowledge and procedure. But it is not. It is an imperfect science, an enterprise of constantly changing knowledge, uncertain information, fallible individuals, and … lives on the line. There is science in what we do, yes, but also habit, intuition, and sometimes plain old guessing. The gap between what we know and what we aim for persists. And this gap complicates everything we do.” Atul Gawande, Complications: A surgeon’s notes on an imperfect science (London, Profile, 2002) p.7. For the first time, this digital exhibition brings together material from the Simms collection across different fields of learning within the wider umbrella of medicine e.g. surgery, anatomy, physiology, pharmacy, dentistry, gynaecology, toxicology and psychiatry, to name but a few. In 1968 Queen’s paid the estate of the late Samuel Simms the sum of four thousand, five hundred pounds for the Simms Collection of medical texts. These were “classical medical books of great variety … and many of the masterpieces of medical thought.” (Letter, Simms to Queen’s Librarian, 25 [month illegible], 1962). Simms had amassed this collection over a twenty-year period. Once described as one of the most selective and extensive of collections in private hands, the enchanting Simms medical collection comprises approximately 3,600 volumes of material, published in English, French and Latin. The preponderance of material relates to the nineteenth and twentieth centuries – including first and early editions – but there are texts as early as the seventeenth century. The collection includes texts, monographs, and some serials, in addition to works on the history of medicine and medical biography. The Simms medical collection is, without question, remarkable, mesmerizing, abundant and yet, also, an untapped resource, not accessed as much as its fabulous content warrants and deserving serious scholarly attention and study! It is a magnificent collection of medical treasures that will be of interest to students of medicine and those interested particularly in the history of medicine. Across the collection, there is much to sample, deliberate on, examine, research and get lost in! The time period covered by the collection is between 1539 to 1924, so it is an impressive survey. Born in Belfast, Simms (1896-1967) was the son of a Presbyterian minister. He studied medicine at Queen’s University Belfast. He was a brilliant scholar, winning several gold medals. He graduated with M.B. BCh, BAO (QUB) with First Class Honours (1919), BSc in pathology and bacteriology with First Class Honours (1920), Diploma in Public Health (1920) and was awarded M.D. (1921). He also undertook research in London, New York, and Vienna. Throughout his esteemed career he worked in Belfast hospitals: first, the Ulster Hospital for Women and Sick Children, and, later, the Royal Victoria Hospital. He was, by examination, a Member of the Royal College of Physicians of Ireland (1928) and was elected a Fellow of the Royal College of Physicians of Ireland (1944). Simms was interested in local history and medicine and he authored material relating to these interests. 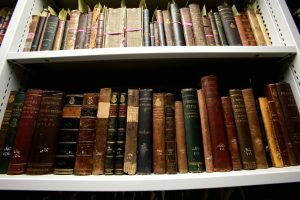 Special Collections and Archives holds publications which he penned, concerning diverse subjects such as the United Irishmen, expansion of Belfast in the nineteenth century and kidney function. The Simms collection is replete with classic authors of medical science, pioneers and luminaries such as William Budd (typhoid fever), Charles Murchison (physician and specialist on fever and liver disease), John Bingham Roberts (plastic surgery), Leonard Landois (physiology), Thomas Pickering Pick (surgery), T.B. Hyslop (psychiatry), Theophilus Parvin (obstetrics), David Berry Hart (obstetrics and gynaecology), Sophia Jex-Blake (education of female medics) and Sir Arthur Newsholme (public health official and epidemiologist). The significant and unique collection contains authors whose new approaches regarding treatment of conditions and prevention completely transformed aspects of medicine. Many of the authors contained within the collection were eminent physicians who worked as clinicians in their respective fields, often conducting and publishing innovative research and belonged to eminent medical associations, societies and hospitals. The collection will be of interest to a range of researchers, including students of medicine and the history of medicine, lovers of book collections, those interested in book history, and those enthralled and captivated by the spell-binding plates, glorious bindings and front covers, intriguing provenance notes and marginalia embedded within texts whose content attests to the progress of scientific discovery over the last few centuries. 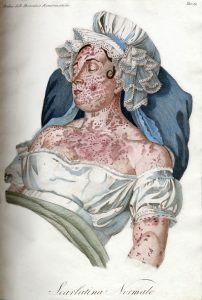 It is the hope that this exhibition will bring the distinctive Simms collection of medical publications to wider audience and to publicise this unique and impressive resource. To view the Samuel Simms digital exhibition click here. To browse a full listing of the Samuel Simms Medical Collection click here. 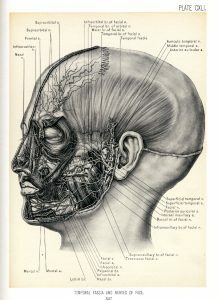 Fig 1: Joseph Nicolas Masse & Edward Bellamy, The handy book of anatomical plates (London: Baillière, Tindall and Cox, 1873), Plate LXXI. Vascular System, Plate XIV (veins). 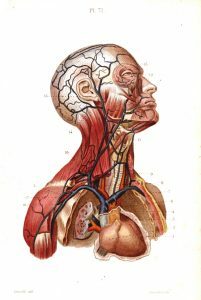 Fig 2: John B. Deaver, Surgical anatomy: a treatise on human anatomy in its application to the practice of medicine and surgery (London : Rebman, 1899-1903), Vol. 1. Plate CII. 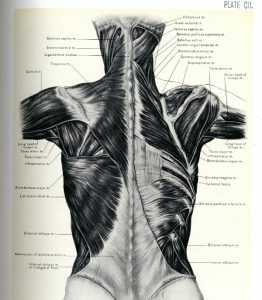 Muscles of back. p. 373. Fig 3: Ibid., Vol. 1. Plate CXLI. Temporal fascia and nerves of face. p. 537. Fig 4: Ibid., Vol. 3 Plate CCCCXXVII. 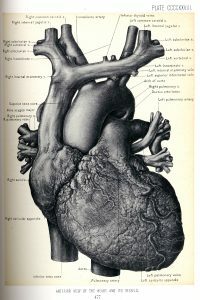 Anterior view of the heart and its vessels. p. 477. Fig 5: William Budd, Typhoid fever: its nature, mode of spreading, and prevention (London: Longmans, Green, 1873), Frontispiece: Plate no. 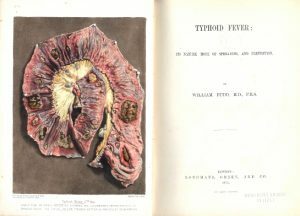 4 (Typhoid fever, 17th day – lower end of ileum) & title page. Fig 6: F.M. 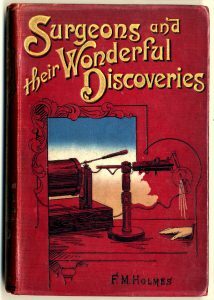 Holmes, Surgeons and their wonderful discoveries (London : Partridge, c.1900), Front Cover. Fig 7: Selection of books from Simms collection, Special Collections, Queen’s University Belfast. Fig 8: Jean-Louis-Marie Alibert, Clinica del Parigino Spedale di S. Luigi ossia trattato compiuto delle malattie della pelle (Venezia : Antonelli, 1835), Plate 12 (Scarlatina normale). Fig 9: Alfred Swaine Taylor, A manual of medical jurisprudence (London: J. & A. Churchill, 1874), Inside Cover. 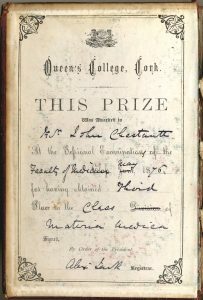 Book was awarded as a gift to John Chestnutt, medical student of University College Cork, 1876. 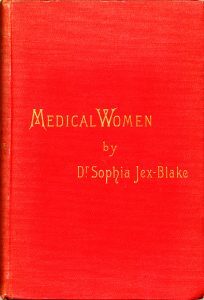 Fig 10: Sophia Jex-Blake, Medical women: a thesis and a history (Edinburgh : Oliphant, Anderson & Ferrier, 1886), Front Cover.